Flowering canola plant. Princeton, KY. 21 Mar 2016. Quite a bit of information for winter canola freeze injury exists (see the end of the blog for links). This past weekend, most of the state remained in the low-30s°F. Weather data can be found at: wwwagwx.ca.uky.edu or www.kymesonet.org. At these temperatures significant damage, even to flowering canola is not expected. The critical temperature for winter canola is mid- to low- 20s°F. Wheat Head Freeze Damage, 2015.
occurred at Feekes 6 (jointing). Much of Kentucky’s winter wheat crop is still tillering (Feekes 4-5; Figure 1) or just beginning to joint (Feekes 6; Figures 2 and 3). The weather forecast for this weekend is predicting that some areas of Kentucky will dip to 32°F or less. Given that most of our wheat is at Feekes 4 or 5, with some at Feekes 6, these temperatures are not cause for concern. Temperatures must be 12°F or less for 2 or more hours to injure wheat that is at the Feekes 4 or 5 growth stages, which much of our state is now. For the more advanced wheat that is jointing, Feekes 6, temperatures must fall to 24°F or less for 2 or more hours. 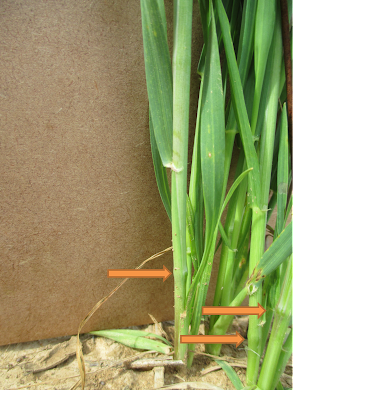 Although the weather forecasts do not project conditions that we would expect wheat injury, examine weather data and scout your fields to determine is freeze injury occurred. Freeze injury can occur in small areas of fields, which are associated to low areas of fields where cold air settles. 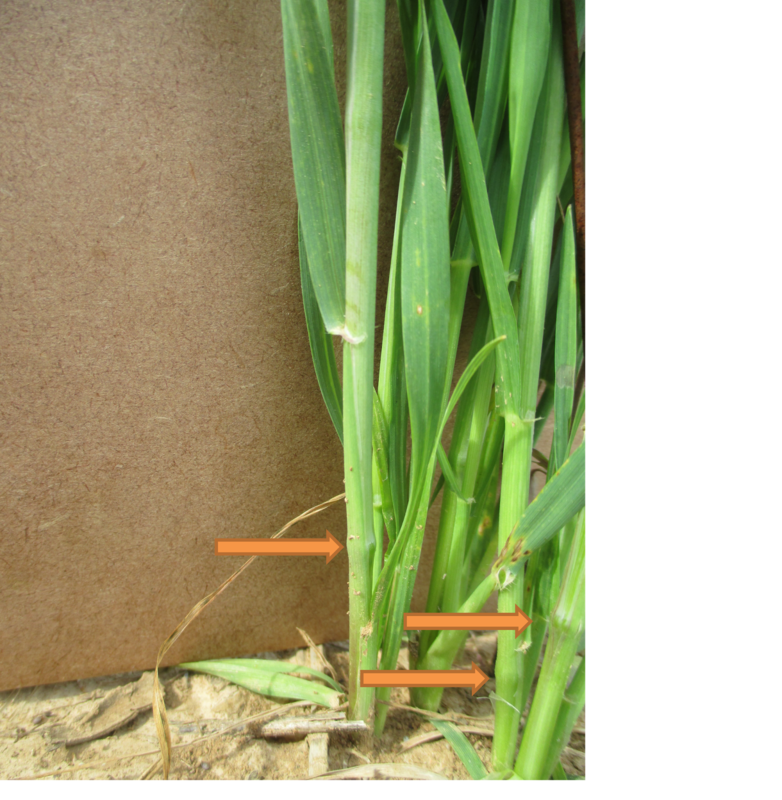 Be sure and check for wheat stems damage close to the soil surface; characteristic symptoms of freeze damage are listed in Table 1. It typically takes about 10 days of warm temperatures before injury can be seen. Weather data can be accessed by clicking on the link of your county at wwwagwx.ca.uky.edu or www.kymesonet.org. Figure 2. Wheat at Feekes 6 growth stage. "Joints" are indicated with orange arrows. Figure 3. Wheat at late Feekes 5/early Feekes 6 growth stage. after the top few leaf sheaths were removed.